Our Soaring Free Superfoods? shelled hemp seeds are mechanically hulled to preserve heat sensitive nutrients. With over 30% protein content, hemp seeds provide the perfect complete plant protein source for vegans and vegetarians. Hemp Protein Powder is an easily digestible complete protein for building and repairing tissue. It even boosts your immune system and contributes towards digestive and colon health! This ancient food can be traced back thousands of years across multiple cultures, where it was revered as complete food source. Hemp seeds, also known as hemp hearts are the soft seed once shelled from the tough outer casing. Hemp seeds contains all the essential amino acids, is high in fibre and contains Omega 3 & 6 essential fatty acids in a unique, near perfect ratio for human nutritional needs. Our Soaring Free Superfoods? shelled hemp seeds are mechanically hulled to preserve heat sensitive nutrients. With over 30% protein content, hemp seeds provide the perfect complete plant protein source for vegans and vegetarians. 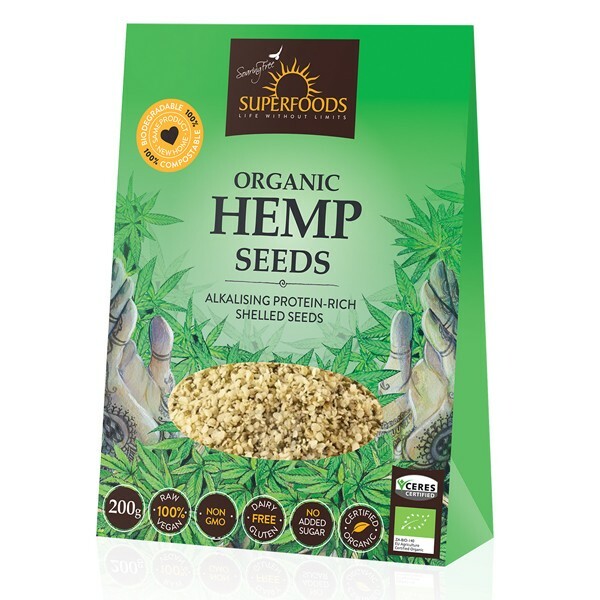 Shelled hemp seeds have a great nutty flavour, and are extremely versatile. Hemp milk is a delicious dairy alternative. Blend 1 cup of hemp seeds with 4 C of water adding vanilla and a natural sweetener for flavour. You can create a sweet hemp cream by reducing the ratio to 1 C hemp seeds to 2 C water. Use hemp milk or cream over fresh fruit, muesli, or chia porridge. Alternatively make a savoury sauce, using hemp seeds, nuts, garlic, lemon and salt to enjoy over steamed veggies. Charge up your smoothies with hemp seeds as an alternative option to dairy or yoghurts. Sprinkle them over salads and into soups. You can even make hemp cheese! Excellent pre & post intensive exercise. Recommended 50g daily.